The Rio Texas Conference met in Corpus Christi, TX, June 7-10, with Bishop Robert Schnase presiding. 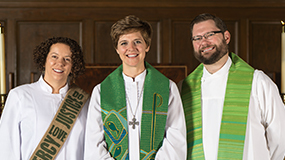 This year’s theme was “Focus on Fruitfulness.” The Conference discussed and approved moving forward with a new Child, Youth and Vulnerable Adults Safety Policy, effective June 2018; adopted the 2018 budget; approved nominations to conference committees; and was challenged by outstanding preachers and teachers including Rev. Adam Hamilton. Two clergy, Rev. Taylor Fuerst and Rev. Cathy Stone attended. Our lay delegates were Teresa Edwards, Sandy Wilder, and Davis Covin serving as FUMC delegates, and Rick Ortiz, Noble Doss, Penny Appleby, and Susan Griffith serving as Capital District delegates. The organization and handling of the business sessions was well planned and executed. Prior to attending the Conference, delegates received the Pre-Conference Report detailing the information to help the delegates make informed decisions. During the first day the attendees heard the preliminary reports from the various ministry areas. In addition, many of the groups had staffed tables in the exhibit area where delegates could get additional information prior to voting. This resulted in the conference concluding action on the agenda items very quickly. Adam Hamilton, Senior Pastor of the Church of the Resurrection in Kansas City, Missouri, the largest United Methodist church in America with a membership of 20,000, presented three teaching sessions on Leading Beyond the Walls. His sessions focused on What Leaders Do and Why, Effective Worship and Preaching, and Mission, Evangelism and Methodism. His unique style and personal testimony made his sessions both entertaining and inspiring. Bishop Schnase’s training session on Saturday morning was an appropriate send-off for the attendees. He focused on what we as Methodists must be about in order to assure the continuation of a viable church. We must be Christ-centered, fruitful, pursue excellence, have accountability and collaborate. In addition to the general training sessions, workshops were held for specific interest groups. These workshops were led by lay leaders and ministers from throughout the Conference. For all three days at Annual Conference we had the opportunity to listen to Rev. Adam Hamilton, Senior Pastor of The United Methodist Church of the Resurrection speak about a variety of topics which appealed to laity and clergy. Rev. Hamilton’s church began as a tiny community which grew to become one of the largest in the United States. This year’s Annual Conference theme was focused on “Fruitfulness” and most of the topics centered on leadership, true Christian values, and focusing outwardly on the broader community. Improving these aspects should lead to a more fruitful congregation and denomination. I found Hamilton to be an exceptional speaker who has a very relatable presentation style and theology. Recordings of his teaching sessions can be found on the Rio Texas Annual Conference YouTube channel. Hamilton was conscious to keep his material appropriate for churches of varying sizes and for congregations with a variety of situations. I believe everyone sitting in his teaching sessions could find something that would be applicable and useful in their home churches. In addition to the teaching session, we also had the chance to attend workshops focused on specific topics. I attended a workshop titled “Free or Cheap Tech Tools for Church Effectiveness” by Rev. Will Rice, Director of Communications and Media, Rio Texas Annual Conference. Rice discussed how technology has gotten more accessible and less expensive, making it available to even the smallest local churches. He provided free and inexpensive technological tools which can improve the effectiveness of church ministries and increase the fruitfulness of those churches. The website https://riotexas.org/media/ lists many of these cheap and free tools for our congregation to use. I was somewhat surprised when invited to attend my FIRST ever Annual Conference as an “At Large” delegate from our Capital District. With excellent guidance from Sandy Wilder, I decided to attend and “see how sausage is made.” I had been forewarned that these meetings were often contentious and, occasionally, provincial if not downright petty. NOTHING could have been further from the truth! What I experienced over the three days was not only enlightening but SPIRITUAL in every sense of the word. I witnessed excellent TEACHING from Rev. Adam Hamilton and benefitted tremendously from experiencing our Bishop Schnase in action as a leader, teacher, and serious man of God. We are fortunate in every respect to have him! Yes, there were some times where I wandered around the Convention Center to daydream and see other delegates and there was “administrative tedium,” as expected from the “business” aspects of the meeting. I also found the worship services to be quite wonderful, with excellent music, passionate preaching, and solemn communion. Most of all, I truly enjoyed my compadres, ministerial and lay folks. We laughed, cried (yeah, grown men do that), and generally shared a most memorable time together. 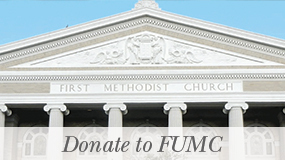 As United Methodists, we do face momentous decisions going forward. As Rio Texas Conference United Methodists, we have challenges that must be addressed. But I am confident, leaving this Annual Conference, that the United Methodist church has so much to offer our community, our nation, and our world that we cannot, and we must not, fail. And I am even MORE confident that we won’t! 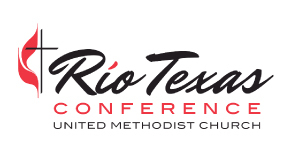 Thank you for the opportunity to represent FUMC as a delegate to the Rio Texas Annual Conference. It was a wonderful experience to understand more about our church beyond the local congregation. Somehow, I had never focused on the fact that in 2015 our conference, the Southwest Texas Conference (which had been defined geographically) and the Rio Grande Conference (Spanish speaking) had merged. Opening worship was led by Bishop Robert Schnase, who speaks Spanish fluently and easily transitions between languages. The Rev. Lupina Villalpando Stewart gave the opening worship sermon, which was spiritual, funny, and presented in both languages. It made me extremely proud to be part of a dual-culture conference that in such a short time seems to be unifying. The successful merging of cultures is a microcosm of what we might hope for the world. Teaching sessions led by Adam Hamilton were held twice a day and were very inspirational. He reminded us that growth requires changing the way we do things in our local churches. People are hungry to experience God in the world and to learn more about Him through intentional discipleship. One afternoon I attended a workshop led by Rev. Javier Leyva, who explored what it means to be in ministry WITH the poor as opposed to ministry to/for the poor. Being in relationship with those in need enables both of us to grow. This was truly an enlightening experience for me. My hope is that more people from our congregation are able to go in the future.